"Ad Lib", which is to say ad libitum, used by the ancient Romans to mean "at one's pleasure". So we might say one name one shipyard, since the vessel in question was built for Gary Lane, chairman of Alloy Yachts, the New Zealand yard where it was produced. 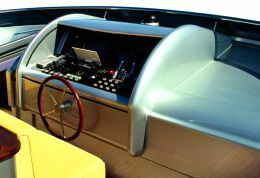 A company, as the name suggests, specialising in customised yachts in aluminium, chiefly sailboats. Such as Victoria of Strathearn, a 130' ketch designed by Langan Design; Georgia, a 48 metre sloop designed by the Scanu team, Dalrymple-Smith and Johnson; or Tiara, a 54 metre sloop designed by Dubois Naval Architects. This is to name just a few that have been praised by critics not only for their design but also for quality and innovation in their construction, vessels that have demonstrated all the potential of this yard which is distant from us only geographically. So this Ad Lib, over and above being the new Alloy Yachts flagship in terms of motoryachts, summarises the potential expressed by the yard in sailboats, well representing its way of building absolutely custom boats, which is to say "at the pleasure" of each owner, ad libitum. 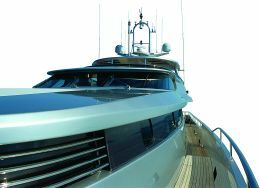 Ad Lib, obviously with hull and superstructure in aluminium, was launched in September 2005 in Henderson, Auckland, where Alloy Yachts is based. But by winter she was already in the Mediterranean, ready, we bet, to put up a good show at upcoming local regattas. Flying a Cayman Islands flag, she is 40 metres long (131'), designed by Ed Dubois who among other things was responsible for the former Alloy powered flagship, the "S.Q.N. ", built in 2003 with two and a half decks, just three feet shorter and also built for Gary Lane. The vessels have many technical and layout affinities but there are also more than a few differences. The newer seems a natural evolution of the older. This is above all evident from a technical viewpoint, with the waterlines for example, since Ad Lib profited from the same test tank studies carried out for the displacement hull of S.Q.N. With an extended waterline length and the use of more powerful engines, better performances were obtained, but still within the context of a long range cruiser. One aim of the studies was to improve sea keeping, with view to offering owner and guests a boat that was as comfortable as possible under all conditions. A superyacht, then, for long cruises, quantifiable in more than 4.000 miles at a speed of 10 knots, whereas actual cruising speed is 14.5 knots and maximum speed 16.5 knots. Power is provided by two Caterpillar 3412 engines, each of 1.400 HP. The tanks too were suitably dimensioned for long range voyaging - 36.000 litres of fuel and 10.000 of water - as were the double Idromar desalination apparatus, each one capable of supplying up to 4.500 litres of fresh water daily, and the two great Northern Lights generators of 66 kW each which provide energy for this large floating villa. 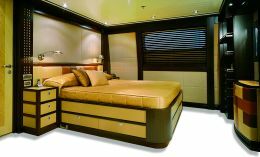 There is a rich selection of accessories on board, also from the comfort point of view. Ad Lib has an efficient electronically managed stabilising system - Naiad 420 - and a 288.000 BTU/hr air conditioning system for the interiors. It is thus wholly efficient for any periods of chartering. 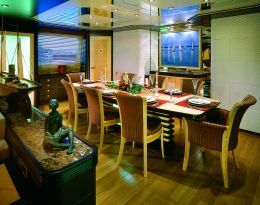 The interiors are the work of the Don Starkey Design studio which had already done S.Q.N.. This time they used furnishings with decisive chromatic contrasts and considerable use of leather for generally spacious areas where great attention was also paid to privacy. 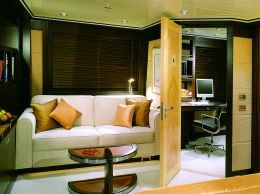 The current owner chose a configuration in which the guest zone is concentrated on the lower deck, with two double bed cabins and one twin-bed cabin with a third foldaway bed, all with private bathroom. Another cabin can be obtained by using the place currently occupied by the Gym, which is a small room with en suite bathroom. 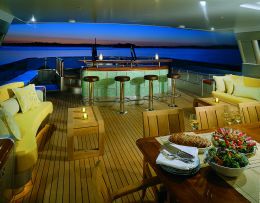 The rest of the deck is for the crew, for the skipper, who has a double bedroom, and for service personnel, with two cabins sleeping a maximum of five. All cabins have a private bathroom. 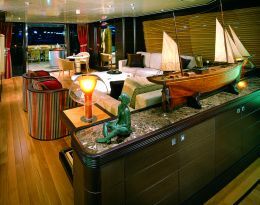 The owner wanted his cabin forward on the main deck, accessible by way of his study. 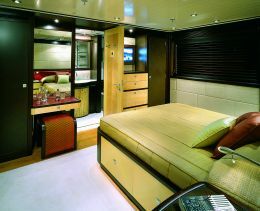 The double bed is on the port side, the sofa on the starboard side. There is a large wardrobe, double bathroom and a spacious shower room. 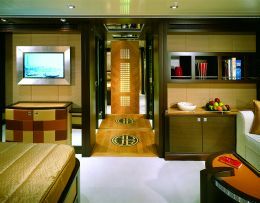 One place on board worth pointing out is the "Alfresco Entertaining" area, on the part of the flying bridge protected by a fixed Bimini top in composite to reduce weight. Extremely convivial in the distribution of space and seating, it also has a bar and service furniture. 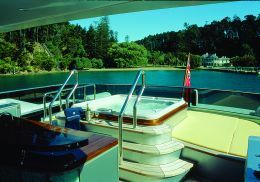 Aft there is a large Jacuzzi for six, surrounded by a sunbathing area. The outside dining area is forward, with a table for six that can be shaded from the sun by a moveable covering. The bridge is farther forward. A 5.30 metre tender is housed in the garage aft of the engine room, launched by way of an opening on the port side. A second service tender and jet skis, with launching davits, are stowed forward on deck. As for certification, Ad Lib has not only the most comprehensive Lloyds recognition but also corresponds to MCA regulations.